Psychological Skills for Squash Coaches??? The rationale for the necessity of “peak performance” or stress management strategies will be evident after reading the references. 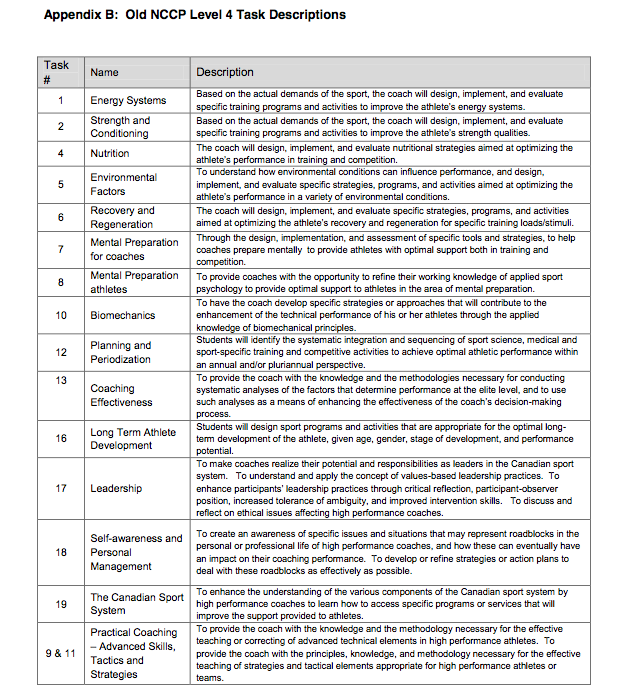 The Canadian National Coaching Certification Program (NCCP) Level 4/5 (i.e., Elite/National Coach) program featured two courses in this area: Task 8: Mental Training for Coaches (which I taught several times at the NCCP National Coaching Conferences – in both English and Francais:) and Task: 16: Enhanced Coaching Performance. a) Your current level of “coaching stress” (as opposed to academic or relationship stress). b) Identify three “mental training” strategies (either ones you use now or from the reference material) that you could use to either improve your “game day” coaching performance or reduce your short term or long term coaching stress. Seven Habits of Highly Effective People – point form summary could be useful – and here is a useful downloadable weekly planner based on the book. Squash Psychology: Not always in a textbook! 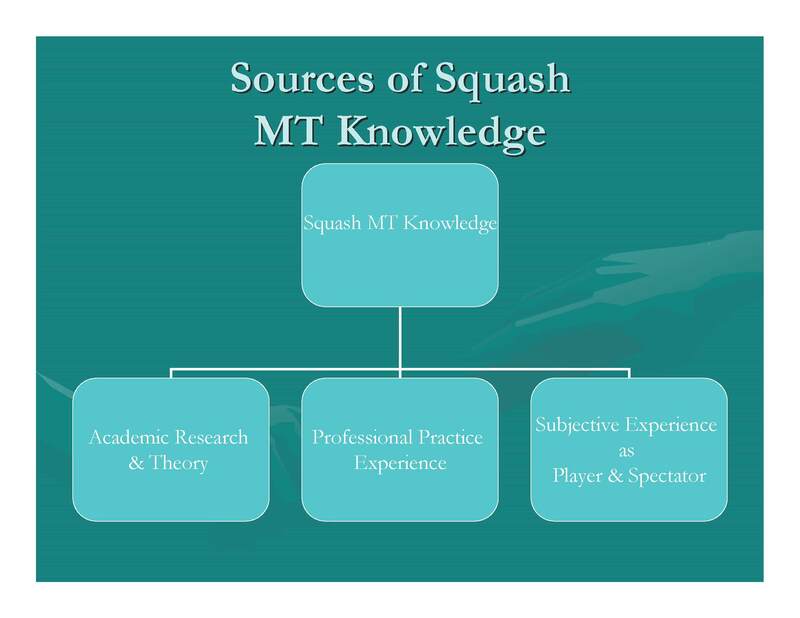 The above slide shows that squash coaches can obtain useful knowledge of squash psychology (MT = mental training) from three sources – the information in Hunt’s book falling into the “subjective experience as a player” category since he had not done any significant coaching at that point in his career. 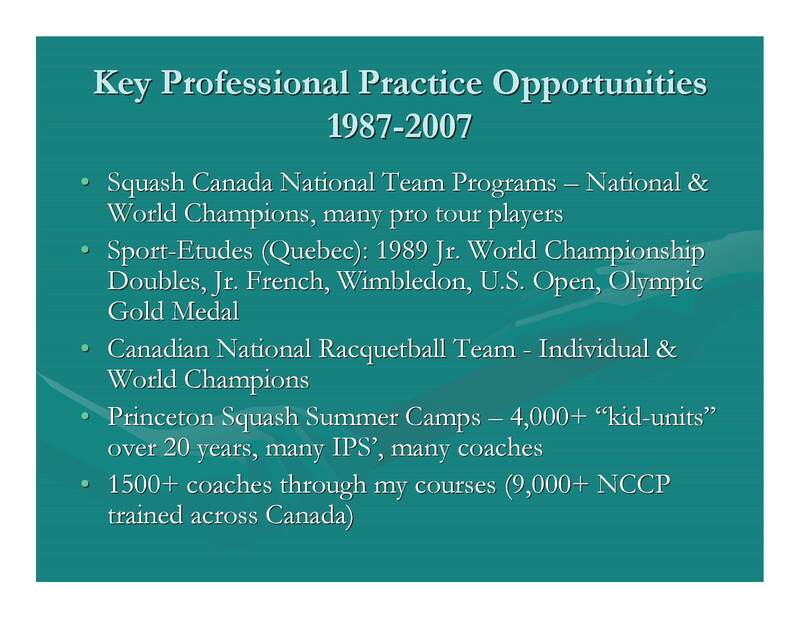 “Professional practice experience” would be that knowledge picked up as a squash coach or sport psychology consultant through observation and practical experience working with players and other coaches. This latter component can be critical in integrating the other two aspects of squash psychology knowledge. Continued involvement in teaching academic sport psychology has helped me to critically reflect on my consulting experiences outline in the slide below. 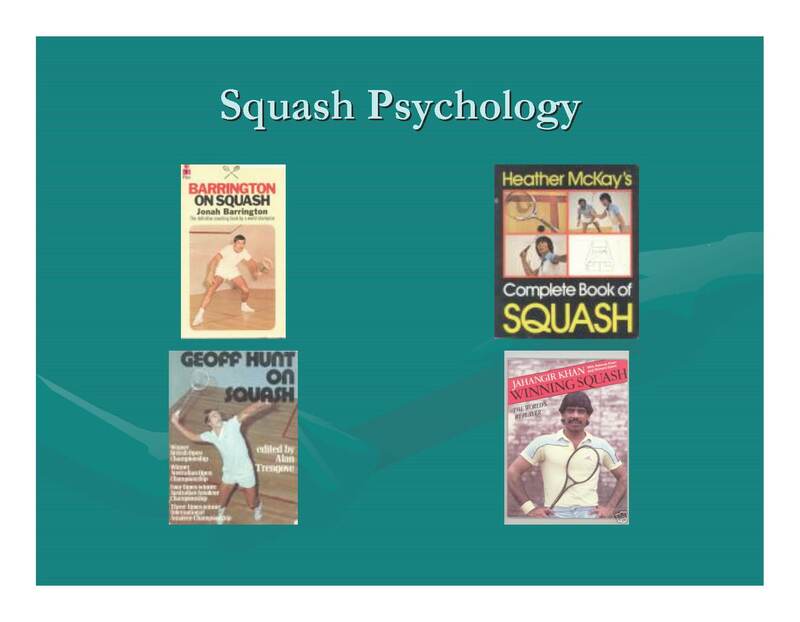 “Regular” squash books written by former top players can be a great sources of sport psychology knowledge – a great supplement or adjunct to sport psychology books and a squash coach’s own subjective experiences as a player and professional practice experience as a coach. I have already written about the importance that enjoyment plays in a young squash player’s motivation to play squash. A very simple approach for squash coaches is to make sure that their junior players enjoy lessons, training and competing! 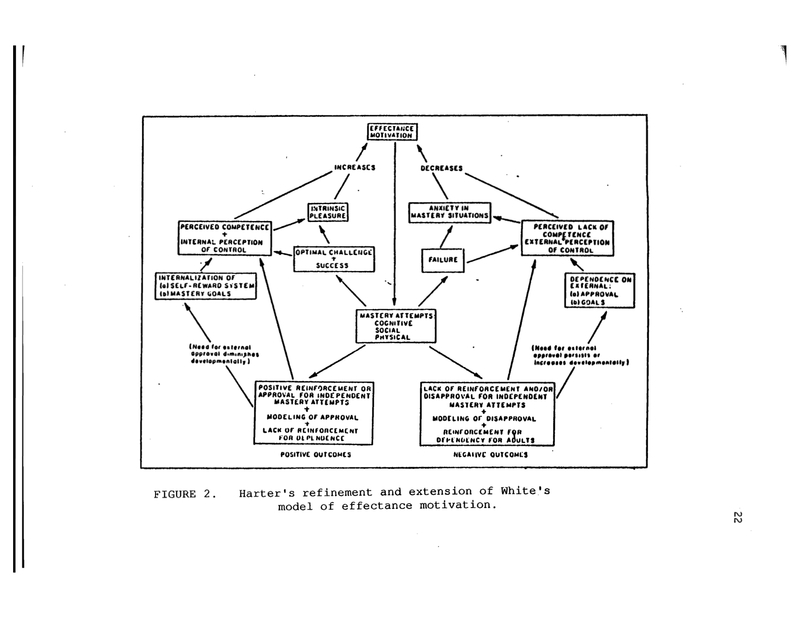 So while “enjoyment” is included (under “affect” which is a synonym for “emotion”) in this model, it is easy to see that the overall picture to developing motivation in children is in fact more complex. What does this model describe? The “type” of motivation a child has (“motivational orientation”), their anxiety level, and the level of success they have (at squash for example), also contribute to competence and self-esteem. To make a long story short, a win-oriented, extrinsically motivated outlook can result in low self-esteem and perceived competence and a process (improvement)-oriented, intrinsically motivated outlook usually results in higher perceived competence and self-esteem. Both feedback and motivational orientation affect self-esteem and perceived competence – which then in turn influence “affect” (the emotions a child experiences) – which in turn influence the child’s motivation to a) choose to participate and b) how much effort they will expend in participating. 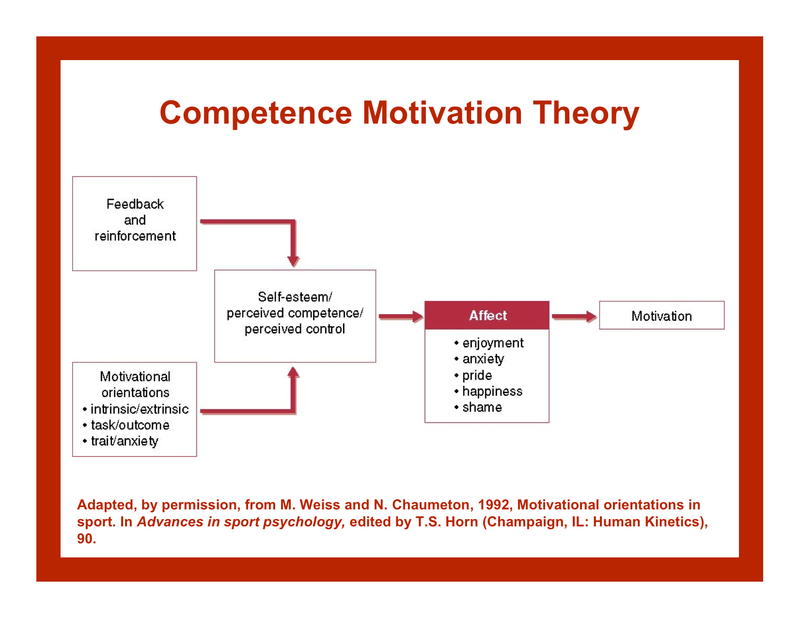 Stating in the center of the diagram (“mastery attempts, i.e., playing squash), the path to the right depicts failure (opponent or drill too difficult) and lack of reinforcement leading to anxiety and low perceived competence which leads to reduced motivation to participate. The path to the left depicts mastery attempts followed by success (an opponent or drill of appropriate challenge) and positive reinforcement leading to intrinsic pleasure and increased perceived competence which increases motivation to participate and continue in sport (e.g., squash). Make sure you are a good coach who actually improves their athletes quickly – i.e., make sure they are successful. Related to the above, ensure optimal task difficulty (competition and practice) – a good practical guide being to make sure they succeed 50-80% of the time before making things more difficult (or get them to stop comparing themselves to others). Discourage a focus on winning and increase focus on improving (or make sure your students always win – good luck with that over a 10-year period which includes puberty and moving up in the age groups every two years :). Make sure parents are on board with the components of Harter’s model – otherwise they can unknowingly sabotage your efforts (more on parents in future posts). Simply setting a psychological goal targeting the mental problem (e.g., choking at the end of a match) is often enough to “cure” the problem. In reviewing hundreds of goal-setting studies in business and sport, researches found an across the board 15% improvement in participants who set specific goals versus those who simply “tried their best”. There is a very good “self-interview” form in earlier editions of Terry Orlick’s book “In Pursuit of Excellence”, and an excellent goal-setting form in his book “Psyching for Sport”. If you drop me a line of can send you a squash-specific, adapted, version of these forms (yes – for free:). 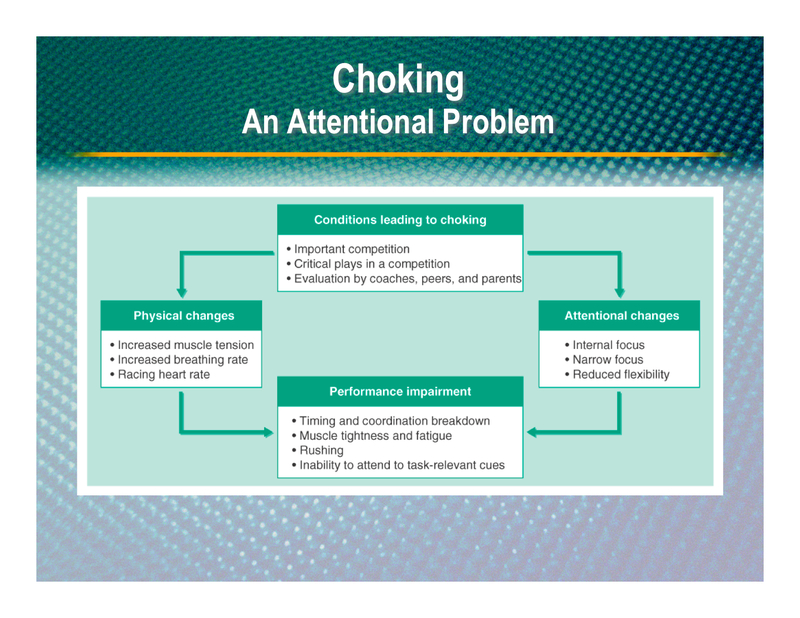 Since most squash performance problems revolve around anxiety (e.g., “I am afraid to lose”) and confidence (e.g., “I don’t think I can win”), understanding the link between anxiety/confidence and attention (see the slide of Nideffer’s simple explanation of choking) makes solving the problem relatively simple – 3-4 weeks work on relaxation and self-talk skills (as in the video below). If the points above do not solve the squash psychological problem, it is likely that understanding and working on two, slightly deeper, more complex phenomona will help: a) importance of a task orientation and motivational climate and b) Albert Ellis’s model of “Rational Thinking. Both are usually related to how a squash player was brought up – in other words how they were socialized into competition by their parents (primarily), peers, sporting organizations and coaches. If goal-setting and basic mental skills training do not address common squash psychological problems, often the reason is that the athlete has what is termed a “win” orientation instead of the more productive “task” orientation. Here is a link to the background reading. If an athlete does have a “win” orientation and their social environment is also “win’ oriented, it takes a fair bit of time (several weeks to months) to get them (and their entourage) to adopt “task” goals. Another common reason that basic mental skills training does not work is that an athlete holds one or more “irrational beliefs” that hinder them from changing their behavior. We all possess these irrational beliefs “(I must be liked and approved of by “everyone”; “I must be perfect”, etc.) to some extent – the key is to recognize them, and not let them interfere unduly with our pursuit of excellence in sport. Luckily, Albert Ellis (considered by some to be the Father of modern cognitive behavior therapy – the current dominant paradigm in psychology counseling) has clearly outlined (in many books and articles) the procedure for disputing the irrational thoughts that cause the unproductive beliefs. 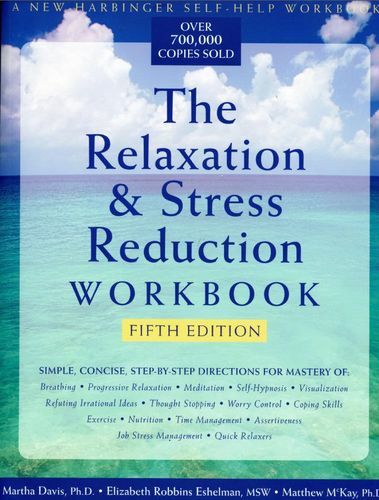 My recommendation is to read and work through the ‘Refuting Irrational Ideas” chapter in the Relaxation & Stress Reduction Workbook – very simple language and lots useful, practical forms and exercises – I have used it with great success when teaching Stress Management to College students. When encountering a on-court mental problems with a player – set a specific goal to improve it – it should help. Most squash mental problems are related to anxiety and confidence – try a basic mental skills program with your athlete – it should help in most cases. If goal-setting and basic mental skills training do not work, the culprit is often a “win” orientation and climate (versus “task”) or irrational beliefs – “self-help” books can be of benefit if this is the case. If necessary seek the help of a qualified sport psychology consultant – here is a link to the AASP consultant finder (I am not a member as I qualified for and was registered with the Canadian Mental Training Registry which predates the AASP Certification). You can click on the “Mental-Psychology” link in the categories section of this blog’s sidebar for more info and squash and psychology. Squash Psychology: Simulate Championship Conditions! One of the final steps in an organized (periodized) mental training program, if for a squash coach to prepare his or her players for the conditions they will meet at the season-ending championship. A tough competitive schedule will do a lot to optimally prepare players – but often there are challenges of the championships that cannot be met through regular practice and competition. simulation – develop exercises to mimic the challenges of the championships. In preparing the Canadian Jr. Men’s team of Jonathon Power, Graham Ryding, etc. for the 1990 World Championships, we set up a match at a Toronto Club with a 4-glass walled court and local pros as opponents – put on uniforms, decorated with flags, and invited parents and friends of the players with cameras and video camcorders. Just because my Smith College team will be competing in the “D” Division at Howe Cup (U.S. College Championships) this weekend, dos not mean we cannot use the same high performance preparation as the world’s best athletes. simulate hot courts by playing a game with blue dots (Yale University courts play very hot with 1,000 plus people milling around). play court rotation tournament during practice in order to practice certain match situations: up 8-3 in fifth, 8-8 in fifth, etc. simulate fatigue by having the players run 10 lengths of the court between every point. Each player has also developed their own individual focus plan that would include the specifics of how to handle these situations, and we spend 4-5 minutes before and after practice visualizing some of these same situations. The hope is that squash players will enter the championships feeling more prepared and confident in their abilities to compete and handle distractions. Optimal preparation for a squash championship can include special mental preparation such a visualization, focus plans and simulations. Simulate special championship conditions that do not occur in regular practice and competition.